There are 800 million people worldwide who access Facebook, most on a daily basis. Most of the time, we’re on our computers at home or on the go. However, Facebook becomes even more engaging when we can post on walls, upload photos and interact with the social network while on our mobile phones. If you have a smartphone, Facebook is just an application on your iPhone, Android, Nokia or other phone. However, what about the huge majority globally who don’t have a smartphone..how can they interact with Facebook? 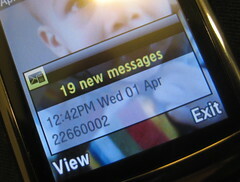 Yes we have SMS based updates, but this level of activity leaves a lot to be desired. Personal Argentina is the first mobile carrier to deploy a Facebook-enabled SIM, making any GSM phone capable of using Facebook. By using the SIM Toolkit commands, Facebook is accessible via a cascade of text menus. All the Facebook interactivity happens over SMS, not an expensive mobile Internet connection. By utilizing Class 2 SMS for connectivity, the user simply pays a monthly subecription and gets unlimited use of Facebook and the carrier gets to sell a value-added service without having to spend money on handset subsidies. This is especially important in nations such as those in South America. Personal Argentina, the carrier, can reach ou to these geographies where Facebook adoption is high, but smartphone penetration isn’t . There’s an eager market of users who want access to social networks, but can’t pay a high monthly tariff for data or for an expensive smartphone.